Old Sturbridge Village, between Worcester and Springfield, re-enacts a town in 1830s New England. It has long been my favorite living history destination in New England. Even more than Plimoth Plantation in Plymouth, Pioneer Village in Salem, New Hampshire, Strawbery Banke in Portsmouth, New Hampshire, and Mystic Village in Mystic, Connecticut, and The Fort at No. 4 in Charlestown, New Hampshire, their costumed re-enactors bring the past to life. There you can learn about old-timey muskets, blacksmithing, pottery, banks, farms, and much more, and they have notable events as well, including an annual outdoor show called The Sleepy Hollow Experience. It’s not a Halloween haunted house but instead a play adapted from the 19th century ghost story, The Legend of Sleepy Hollow, which was set in upstate New York not far away. It’s good enough that I wanted to see the show two years in a row, giving it 5 stars plus last year. It’s an outdoor theatre show that takes place at night along the paths between the real 19th century buildings of the museum grounds. If you wish, arrive early to the museum for a light dinner at Ichabod’s Tavern. It’s a simple communal building that looks like a campground cabin and is lightly themed for Halloween with blacklights. 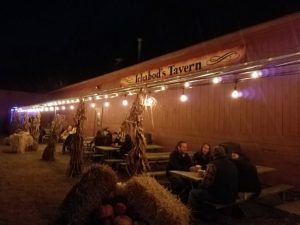 You can sit outside a picnic tables amidst pumpkins, or inside, where they have air conditioning and tables with old time lanterns from their own tin shop. There’s a cute gift shop that sells books about Day of the Dead and ghost stories, Day of the Dead cookie pops, stuffed toys, and sweatshirts. They sell food including pretzels, popcorn, soup, chowder, nachos, cider donuts, cheese, hummus, and fruit, and you can buy alcohol, beer, hard cider, hot cider, hot chocolate, and coffee. It’s a beautiful setting if the evening is warm, but the limited range of foods is not a proper dinner and the place needs a re-enactor to host and entertain guests to make it worthwhile. The only restrooms are portable toilets. Although last year I recommended arriving early and exploring Old Sturbridge Village during the daytime, the gap between the daytime museum closing at 5pm and the play starting at 7:30pm is too long. Instead, my recommendation now is to just arrive a half-hour before the show, when you’re allowed to walk into part of Old Sturbridge Village. There you walk past lit torches and a pond and can enter the saw mill, themed for Halloween with lighting and fog effects. Unless there are clouds in the sky, Old Sturbridge Village is far enough from city lights that you’ll see all the stars. Just to walk around in the darkness with the ambiance of the pond, lighting, and eerie actors in black robes, is remarkable. 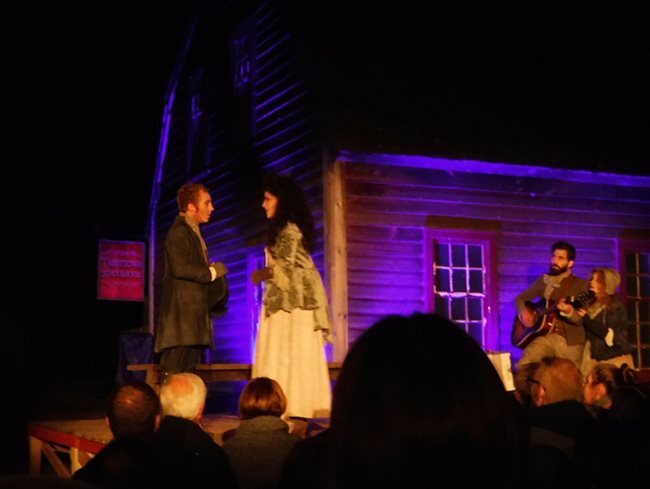 Unlike any other Halloween show that I can think of, The Sleepy Hollow Experience is literary, genuine theater performance, worthy of high marks based on its story and acting alone, even if there were no special effects or wonderful 19th-century setting. The script quotes the original short story but also adapts it in layman’s language for a modern audience, adding music and humor. The cast of six actors, all drawn from out of state, holds no weak performances, and the play takes place in different outdoor locations, so that as an audience you move from place to place throughout the evening. There is plenty of seating for those who don’t wish to stand. The play is a little scary, and has sexual innuendo, but is safe and appropriate for older children. Thankfully, the cast use microphones. (Shouting, as I recently noted at Wolf Hollow, leads to a monotone presentation.) The dirt pathways are wide and free of rocks to stumble on in the dark, and handicapped accessible. The site even has WiFi access. The grounds look beautiful but smell even better. You can smell honey, the grass and trees, and feel the wind on your face. The cast take turns playing narrator to the story, which keep the pace going, and use physicality to transition fluidly from humor to horror, for example jerking as if evil spirits and then suddenly warming up as characters. It’s surreal and interesting. The comedy is genuinely funny but doesn’t undercut the drama or scare. 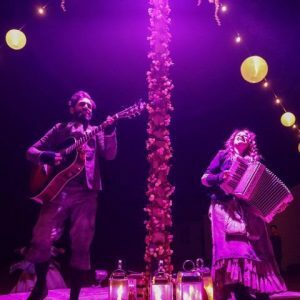 Sometimes the cast will sing to a recorded backing track, but mostly they play their own instruments, two guitars, an accordion, and a tambourine. Ghouls dressed in black cloaks walk around with lanterns, silently, guiding the audience to move from one stage area to the next. You’ll see hay bales and wooden fences, and discreet electric lighting as well as real candle lighting. The play itself is engaging. In many musicals, the plot stops for long musical numbers that leave me bored, but there the music moves the plot forward, and through acting the characters continue to engage us. Notably, the villain of the show had depth and was vulnerable. The actors often break the fourth wall, engaging directly with the audience, and getting us to sing along in places. During the intermission, they take photos with the audience and joke with us. Of course during intermission you can buy cider donuts, pretzels, wine, beer, apple cider, hot chocolate, hot apple cider with rum, coffee, and specialty drinks, which include Ghoul Aid, which is whiskey with grenadine and cranberry juice, and The Headless Horseman, which vodka, ginger ale, and blood orange. Because they show it on a giant image on the website, it won’t spoil the story for me to say that The Headless Horseman makes an appearance on horseback. That’s the big finish of the show, with special effects of lighting, sound, and fog. The ending is a bit confusing, but reading the short story, which only takes a half hour, will clarify it for you. The play is compact and efficient, ending in just 90 minutes, which is perfect so that the audience doesn’t tire of standing. To maintain the spooky ambiance, the cast doesn’t come out for applause and a bow. That’s understandable but unfortunate. 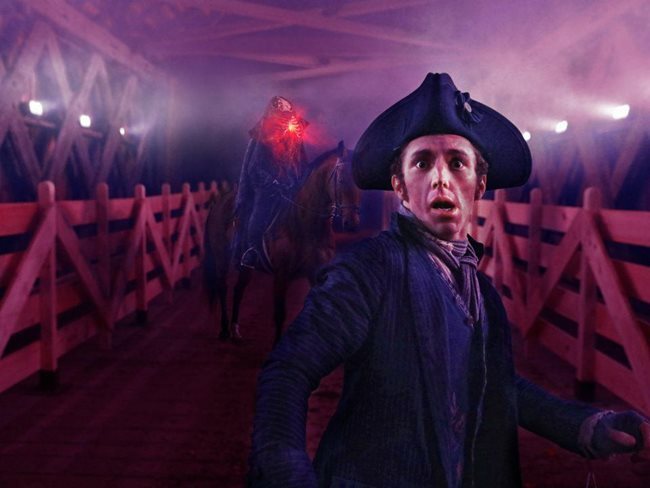 While not educational, The Sleepy Hollow Experience takes place in an authentic 19th century setting with period costume and music and is drawn from a real 19th century ghost story. The natural outdoor setting has great ambiance with its spooky lights, fog effects, tiki torches, wind, and crickets chirping in the woods. Though the preceding dinner opportunity is lackluster, it’s hard to think of any rough edges to the show itself. (Perhaps actors should not joke with the audience on the walk to the final scene.) It is a perfect adaptation, in a perfect setting, with a strong cast and special effects. I’m glad to again give The Sleepy Hollow Experience my rare 5 stars PLUS. Old Sturbridge Village has many other annual events, such as their upcoming Apple and Agriculture Days, October 6-8 and 13-14, which includes the Celebration of Cider and Music Festival on Sunday, Octber 14.